Israeli Defence Minister Amir Peretz says Israel cannot agree to an immediate ceasefire, despite a partial halt to air strikes on south Lebanon. Mr Peretz told parliament that if the offensive stopped, "the extremists will rear their heads anew". He said Israel intended to "expand and strengthen" its operations in Lebanon. 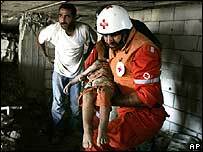 Earlier Israel suspended air raids for 48 hours - apart from those to defend its civilians or troops - to allow an inquiry into civilian deaths at Qana. At least 54 people, many of them children, were killed in the southern Lebanese village on Sunday when the house in which they were sheltering was hit by Israeli war planes - the deadliest Israeli raid since hostilities began on 12 July. The BBC's Jim Muir in Qana says the scene is one of utter desolation. He says Qana has become a ghost village like many others on the road up from the southern city of Tyre, with women and children now a rare sight. Shortly after Israel announced it was suspending air strikes, its war planes struck several targets, including areas near the village of Taibe. The Israeli military said the air strikes were ordered after Hezbollah militants hit an Israeli tank near Taibe, wounding three soldiers. In one incident air strikes killed three Lebanese soldiers in a car near Tyre. Israel expressed regret over the deaths, saying it believed the vehicle was carrying a senior Hezbollah official. Mr Peretz described the temporary cessation of air strikes, which Israel said was to allow an investigation into the incident in Qana and give civilians trapped in the region a chance to escape, as a "humanitarian gesture". The defence minister was interrupted by Arab members of parliament many times as he addressed the special session. Mr Peretz's comments came after US Secretary of State Condoleezza Rice said the US would seek a UN resolution calling for a ceasefire this week. Speaking after talks with Israeli officials in Jerusalem, Ms Rice said the US would call for UN Security Council action on a comprehensive settlement. She said it would comprise three parts: a ceasefire, the political principles that provide for a long-term settlement and the authorisation of an international force to support the Lebanese army in keeping the peace. "As I head back to Washington, I take with me an emerging consensus on what is necessary for both an urgent ceasefire and a lasting settlement," Ms Rice said. "I am convinced we can achieve both this week," she added. US President George W Bush meanwhile said on Monday that the UN had to address the "root causes of the problem". "We want there to be a long-lasting peace, one that is sustainable," he said after meeting Cuban-American business leaders in Miami, Florida. Earlier, UK Prime Minister Tony Blair, on a trip to the US, said he was optimistic of the chances of an end to hostilities. While calling for "maximum pressure" to get the Security Council resolution passed, he also called for "maximum restraint" in the region and welcomed Israel's partial ceasefire. 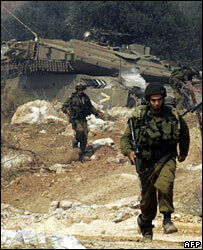 Meanwhile, fighting between Hezbollah militants and Israeli ground troops has been continuing in southern Lebanon. The BBC's Richard Miron in the Israeli border town of Metulla says the Israeli military has been shelling targets in the Lebanese villages of Taibe, Kila and Adasya. For their part Hezbollah militants fired two mortar shells which landed near the Israeli village of Kiryat Shmona on Monday, without causing injuries. Lebanon's health minister says about 750 people - mainly civilians - have been killed by Israeli action. A total of 51 Israelis, including at least 18 civilians, have been killed in the conflict.